Is the solution more shelters or affordable housing? The face of homelessness is changing in the United States. In the past, the homeless typically were single men and women who lived on the street or in shelters; many were mentally ill or drug addicts, or both. But today's homeless may well be a suburban couple with children who lost their home to foreclosure and are staying with relatives or living at a shelter. As the recession continues to ravage the middle class and the working poor, job losses and medical emergencies add to the number of homeless Americans. Advocates for the homeless also cite a shortage of affordable housing. 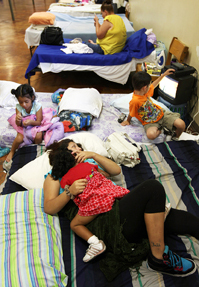 A 2008 federal government survey showed a one-year 9 percent increase in families relying on homeless shelters. In recent months, local governments and school districts have been reporting homelessness cases more than doubling this year. But funding shortages may force agencies that help the homeless to curtail services.